Doesn't this look delicious?! This recipe is originally from one of the Moosewood cookbooks, Moosewood Restaurant Cooks at Home, and was sent to me by Jessica from the Recipe Club. It's a golden-coloured Spanish peasant stew permeated with the wonderful pungency of rosemary and sage. It is satisfying, not too heavy, and good any time of the year. Serves 4. Very kapha-friendly! In a soup pot, bring the water or stock to a simmer. While the water heats, saute the onions and garlic in the oil (using a separate pot) for about 8 minutes, until soft. Stir the turmeric and paprika into the onions and saute for a minute. Add the potatoes, rosemary, sage and the simmering water or stock. Cook for about 12 minutes, until the potatoes are tender. 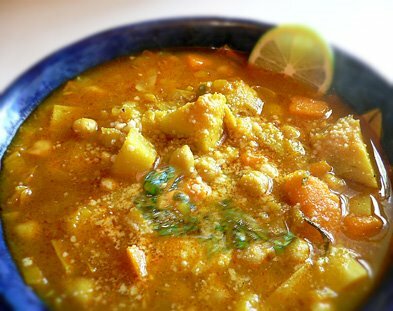 Stir in the pureed squash or sweet potatoes, and add the drained chick peas and artichoke hearts. Remove the rosemary sprig, add salt and pepper to taste, and return to a simmer. Serve with lemon wedges and top with grated Romano or Parmesan cheese*, if you wish. Jessica says, "I complete this meal with some warm crusty bread with butter, and some marinated olives on the side. Happy stew slurping!" *NOTE hard cheeses such as Romano and Parmesan are unbalancing for all doshas. Instead, try sprinkling with toasted anise seeds for a wonderful licorice-scented crunch, or toasted ground almonds. This stew is absolutely delicious and easy to put together! This stew is wonderful! My 1yr old DS picked out all the artichokes and only ate them, but I loved it all!